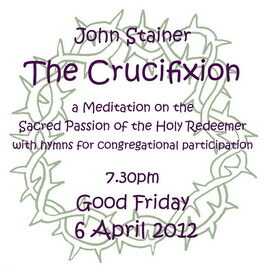 In Holy Week 2012, there were no fewer than three opportunities to hear John Stainer’s The Crucifixion. Two were broadcast: on Palm Sunday, the BBC Singers at St Paul’s, Knightsbridge, with the original organ accompaniment; on Good Friday, the BBC Concert Orchestra at Canterbury Cathedral, in a version orchestrated by Barry Rose.The third opportunity was at our own Good Friday meditation, where a greatly-augmented St Margaret’s choir led worship. Not only were there almost thirty performers, but the church was very full. We didn’t count, but the number of service sheets used suggests that the congregation numbered about 90. And didn’t they sing well in the five hymns!The idea came from Myra Tarr, who has long wanted to repeat the two 1980s performances given in St Sebastian’s, Wokingham Without, Berkshire, with the aid of friends from Maidenhead. And the project built on two 1995 performances (in Dunfermline and Rosyth) of most of the work, given by the combined choirs of the three St Margaret’s churches in the area (the Roman Catholic Church, the Church of Scotland at Touch, and our own).Holy Week is very busy for musicians, but friends in local choirs answered the call, and we had the support of singers from all Christian traditions, some of whom came from a considerable distance. We were also pleased to welcome William Campbell, assistant organist at Dunfermline Abbey, as organist, and Jill Goode from Maidenhead as our guest conductor. The principal soloists were Andrew Polson (tenor) and Martin Tarr (bass), with solo contributions by all the other basses! The effort made was enjoyed by the singers, both in rehearsal and performance, who were greatly encouraged by the turnout. 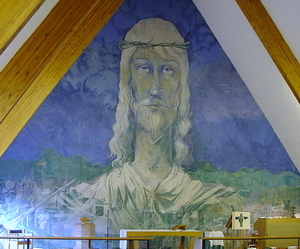 Unfortunately, when you are singing yourself you can’t hear the full effect of the choir, nor are you helped to focus on the crucifixion by being able to see Christ with the crown of thorns in the mural by Derek Seymour, which is behind you. The contribution made to their Holy Week reflection was greatly appreciated by the congregation, and the response suggests that it was a moving and inspiring evening, and that the commitment of those taking part, both the performers and the congregation, had made the service a highlight of Holy Week for many. This was a team effort, and a well-deserved note of thanks has been posted at this link. The music was recorded, and is available for download at this link: limited supplies of a CD version are also available at a nominal charge. The order of service, containing the text of the work, is available at this link. If the work is not familiar to you, there is a programme note at this link.